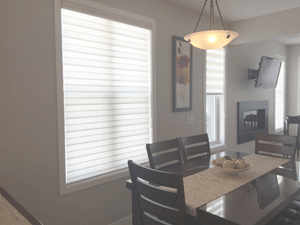 Shade-O-Matic Concept Dual Roller Shade is a trending window covering product that is gaining momentum in Calgary. All the benefits of a horizontal Silhouette Shade with the Roller Shade look and feel. Dual Roller shades provide you the flexibility of openness and privacy all in one product. This Roller shade has one continuous fabric that alternates between a sheer voile and a privacy fabric, giving you total control over your view and privacy. Tilt the blind and you get warmly diffused light throughout the room. Tilt the blind again and you get privacy without total darkness. Fabric wrapped headrail is a standard feature with a continuous loop cord. Shade Can be Fully Up, Semi-Private, and Private positions.